Each year, more than 100 young people die on Washington roadways. Teen Driver Safety Week, October 21 – 27, aims to help reduce those numbers while raising awareness about teen driving nationwide. It’s a great opportunity for parents to focus on helping their teens learn how to become better drivers. The Department of Licensing will be sharing helpful information about teen driver safety on its Twitter and Facebook pages throughout this week. DOL’s social media will be sharing information about distracted driving, seat belt use, underage drinking, driving under the influence of marijuana, rules for the road, and more. You can also learn more about teen driver safety on this fact sheet. The sheet includes steps parents can take to help teens become better drivers. The state’s Target Zero campaign also has this helpful info graphic for parents, too. The Department of Homeland Security has determined that Washington State is fully compliant with federal REAL ID requirements, which means standard driver licenses and ID cards will continue to be accepted for boarding a domestic flight through September of 2020. It’s important to know that beginning October 1, 2020, individuals will need to present federally acceptable identification at a TSA checkpoint in order to board a domestic flight. The enhanced driver license or ID card is optional. A valid U.S. Passport or U.S. Passport Card, military ID, or other federally approved identification can be used to board a domestic flight or enter certain federal facilities. If a resident has another federally approved identification, does not fly, or does not plan to visit a military base or certain federal facilities such as prisons, they do not need an enhanced card and will have the option to apply for a standard driver license or ID card. For more information about REAL ID and what it means for Washington, visit the DOL website. The Washington State Department of Licensing launched a modernized driver licensing system over Labor Day weekend. Customers will experience slower service during this transitional time. The new system will improve services to citizens, agency business partners, and the state’s transportation system. State and federal agencies that rely on DOL data for public safety, licenses, identification cards, and revenue will also benefit from the new system. This is the second in a series of overhauls to DOL’s legacy systems. The first phase, which updated vehicle licensing systems, was successfully completed in December 2016. A third project is planned to address the agency’s Business and Professional Licensing systems. For more information about DRIVES, visit http://www.dol.wa.gov/about/what-is-drives.html. The Department of Licensing’s transition to a new and improved computer system is underway. It started with some of our online services beginning to shutdown on Sunday, August 26. Those online services will return on Monday, September 4. All driver licenses offices will be closed this Friday, August 31, through Monday, September 3. And all vehicle licensing offices will be unable to do vehicle transactions from August 31 through Monday, September 3. All of these impacted areas—driver licensing offices, vehicle transactions, and online services—will be available on Tuesday, September 4. DOL apologizes for any inconvenience these closures may cause. We also look forward to serving you better than ever before, thanks to our state’s new, user-friendly computer system for driver and vehicle services. For more information, please visit dol.wa.gov. The Washington State Department of Licensing is preparing to launch a modernized driver licensing system at the end of August, and customers need to be aware of office closures and service disruptions. In order to transition from the old system to the new system, driver licensing offices will be closed Friday, August 31 through September 3. Vehicle licensing offices may be open, but unable to provide licensing services. Beginning August 26, and throughout the weekend, many DOL online services, like those used to buy car tabs and renew driver licenses, will also be unavailable. A full listing of affected online services is now available on the DOL website. Once complete, the second phase of the DRIVES project will improve services to citizens, agency business partners, and the state’s transportation system. State and federal agencies that rely on DOL data for public safety, licenses, identification cards, and revenue will also benefit from the new system. OLYMPIA— The Washington State Department of Licensing is preparing to launch a new, fully modernized driver licensing system. The $34.8 million DRIVES R2 project will improve services to citizens, agency business partners, and the state’s transportation system. State and federal agencies that rely on DOL data for public safety, licenses, identification cards, and revenue will also benefit. Throughout the summer, DOL employees will be training and testing the system in preparation for the anticipated rollout over the Labor Day holiday weekend. 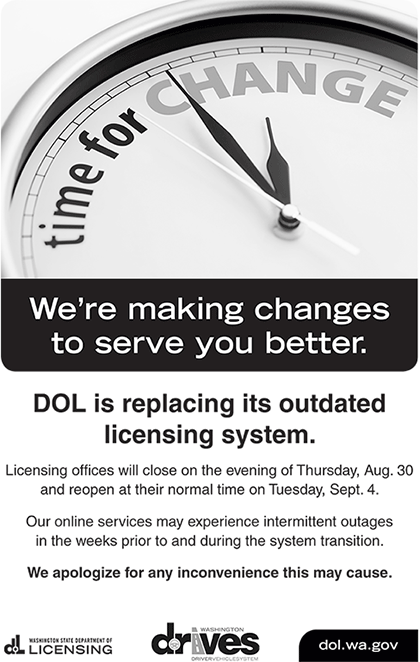 To accommodate the cutover process, DOL’s Licensing Services Offices will be closed Friday, Aug. 31 through Sept. 3. Vehicle licensing offices may remain open during the cutover, but they will be unable to provide vehicle and vessel services. Online services, like those used to buy car tabs and renew driver licenses, will likely be disrupted before and during the cutover process. A full listing of affected online services will be posted later this summer on the DOL website. DRIVES R2 is the second in a series of overhauls to DOL’s legacy systems. The $39.2 million DRIVES R1 project, which updated vehicle licensing systems was successfully completed in December 2016. A third project, R3, to upgrade DOL’s Business and Professional Licensing systems will launch later this year. DOL is proud to be making these changes to serve you better. Updates about the R2 project and service disruptions will be available at http://www.dol.wa.gov/about/what-is-drives.html. Skip a Trip — Go Online. The Department of Licensing has a wide variety of consumer services available online. Please visit our website at dol.wa.gov. You are currently browsing the archives for the Driver license category.